Today morning, the hashtag all over my Twitter TL was #CelebrateBlogging. Soon #CelebrateBlogging was the top trend! Pretty interesting, I thought! Blogging anyway is a celebration of the self that gives us wings, yet keeps us grounded. It is but apt that Blogging be rewarded too and that we #CelebrateBlogging! The occasion was BlogAdda 's birthday celebration. What better way to celebrate than to #CelebrateBlogging ? We were offered cake! BlogAdda promised, "We are going to #CelebrateBlogging and our birthday today. The cake is on us, whenever you say." I tweeted, "Many Happy B'day Wishes your way!" There was no missing this. Enthu followers joined in happily to send Happy Birthday Wishes to BlogAdda and of course tweeting answers to the questions posed by BlogAdda using the hashtag! The first question was what does Blogging mean to us. Blogging means an outlet of emotions- ranging from silly to smart! ; expressing the cacophony of voices in my head & melodies playing in my heart! I tweeted this to BlogAdda and realized that I had forgotten the hashtag! Blogging is an emotional flowchart that taps all the faculties of our minds and hearts to lead our journey in Blogosphere just like a horse pulls a Cart! Blogging gives a great opportunity for celebrating 'I, ME, MYSELF' & also people and things in everyday life and own country and world! Answers were myriad. Here are some of them. Then, BlogAdda posed more questions. And many contributed their honest, serious, crazy, humorous, creative...answers! 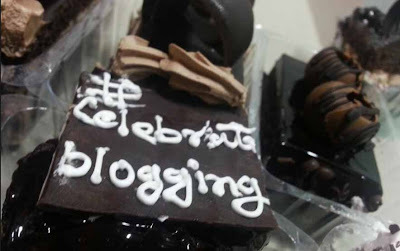 It was thoroughly enjoyable to #CelebrateBlogging with BlogAdda today! As Blog looks great updated and as the new home of the feelings & conversations in our head, I felt I had to create a post about this! Thanks BlogAdda for giving a chance to share & express the said and the unsaid! Happy Birthday again, BlogAdda !! !